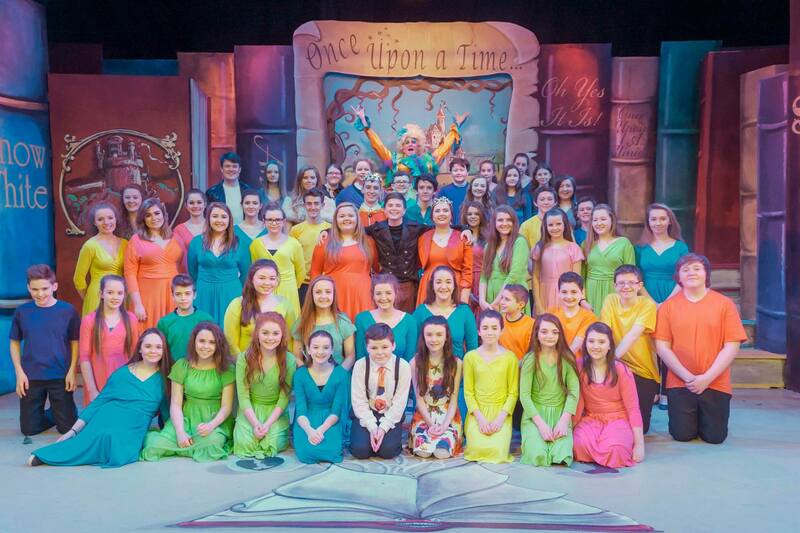 Coalisland has a thriving youth drama scene based in Craic Theatre, a popular arts venue opened in 2002 following extensive fundraising and building by the local community. Every time I visit Craic I am struck by how vibrant and well-used it is. The foyer is always buzzing with locals and visitors alike. It is clearly a labour of love for the staff, many of whom have been involved in Craic Theatre since the beginning when it was a volunteer-run theatre company looking for its own venue. Nowadays Craic has an extremely popular youth drama programme which involves over 100 young people aged 4-18 who attend the weekly workshops. This programme is ably led by a ‘crack team’ of three facilitators who train the young people in theatre skills and direct them in performances throughout the year. The facilitators also write the annual panto. Not only is the panto one of the highlights in the Craic Youth Drama calendar, but it is an event which the whole local community looks forward to each year. On the weekend when I attended, every performance was sold out. So what made ‘Once Upon a Minion’ so special? First and foremost, its young performers. 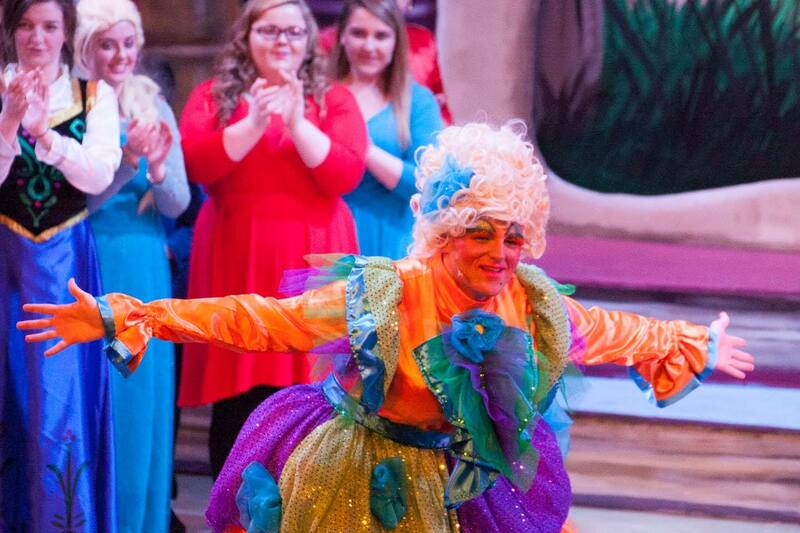 The panto had a cast of 90 young people – and each young person got his or her time to shine. 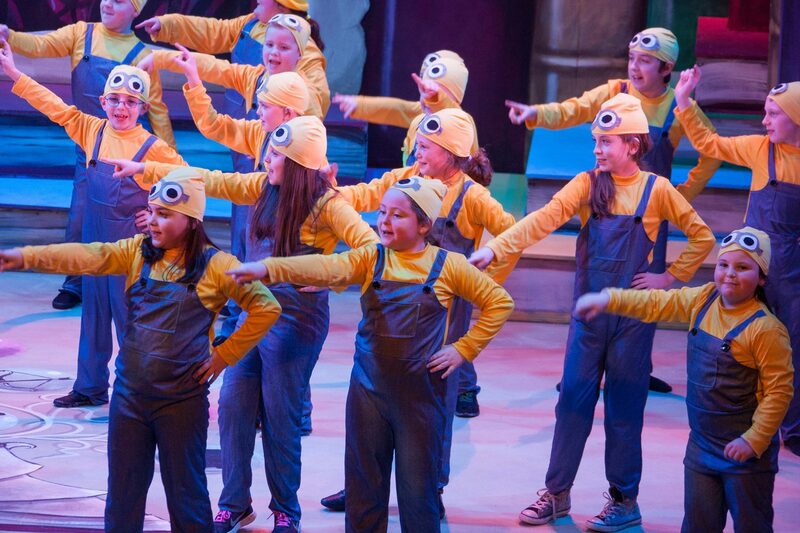 The littlest performers were the Minions, who had us laughing through several brilliantly executed dance routines and a memorable song in their twittering ‘Minion speak’. When watching large casts of children or young people I often scan the faces of those children in the back rows onstage, to check whether they seem to be enjoying themselves. I can assure you that every one of those wee Minions looked like they were having a ball. The older performers – all 50-odd of them – were given distinctive roles as part of the Heroes’ team or the Villains’ team, or else as fairytale characters. Even within the Heroes and Villains there were many individual characters such as the girl called ‘Shhh’, who kept being told to be quiet by the other Heroes but eventually found her own voice through a barn-storming rendition of Katy Perry’s song ‘Roar’. Then there were the not-so-evil sidekicks of the dastardly villain, one of whom fell in love with a Hero (oops! ), one of whom had me in stitches by randomly breaking into an Adele song at the most inappropriate moment, and another of whom had the tendency to catastrophise EVERYTHING. The plot was nicely pitched between a being gentle send-up of fairytales and embracing the magic of a pantomime. For example, when Anna and Elsa from ‘Frozen’ (or was it ‘Foundered?’) made a cameo, the performance of Elsa’s infamous song ‘Let it go’ was delayed and delayed in a way which had parents of ‘Frozen’ fans wincing in anticipation. By contrast, when Aladdin and Jasmine sang ‘A Whole New World’, a wee space was made for stillness and wonder. The sight of this young couple’s expert rendition of the song left me, a seasoned theatre-goer, with a tear in my eye. The magic and wonder were greatly enhanced by the fabulous set and the cheerful colour-blocked costumes which displayed a lovely attention to detail. 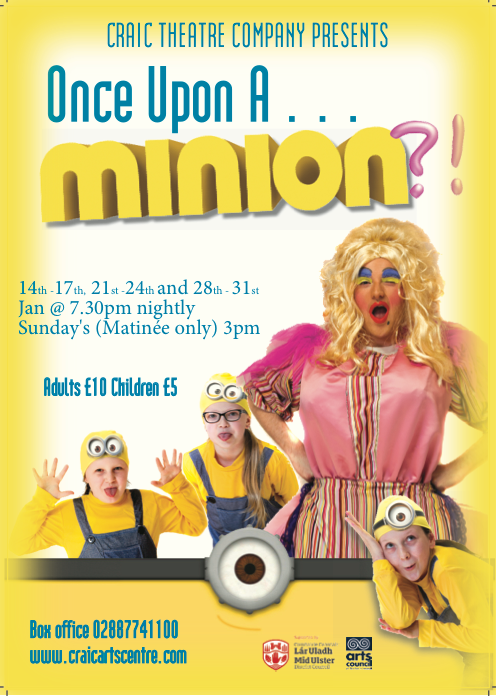 ‘Once Upon a Minion’ delivered on all fronts: it was a visual feast, it fully engaged the children in the audience but had plenty of irony (and a few dirty jokes) to keep the teenagers and adults entertained too. I enjoyed the thread of Coalisland humour which ran throughout. There were several jokes about Stewartstown (Coalisland’s neighbour and occasional sporting rival) but there were not so many local jokes as to make the show inaccessible to a visitor. Most of the humour was universal, silly and big-hearted. Now, few shows are absolutely perfect. There were a couple (and just a couple) of times when I felt that the dame’s performance was slightly overshadowing the other cast members. However, overall, scrupulous attention was given to ensuring that each young person had their time in the spotlight. And believe me, it is not a guarantee that every youth drama performance does this.